BOSTON — 3D printing can now be used to print lithium-ion microbatteries the size of a grain of sand. The printed microbatteries could supply electricity to tiny devices in fields from medicine to communications, including many that have lingered on lab benches for lack of a battery small enough to fit the device, yet provide enough stored energy to power them. 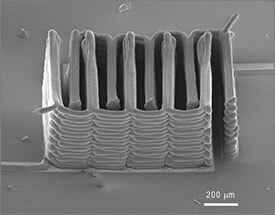 To make the microbatteries, a team based at Harvard University and the University of Illinois at Urbana-Champaign printed precisely interlaced stacks of tiny battery electrodes, each less than the width of a human hair. “Not only did we demonstrate for the first time that we can 3D-print a battery, we demonstrated it in the most rigorous way,”said Jennifer Lewis, Ph.D., senior author of the study, who is also the Hansjörg Wyss Professor of Biologically Inspired Engineering at the Harvard School of Engineering and Applied Sciences (SEAS), and a Core Faculty Member of the Wyss Institute for Biologically Inspired Engineering at Harvard University. Lewis led the project in her prior position at the University of Illinois at Urbana-Champaign, in collaboration with co-author Shen Dillon, an Assistant Professor of Materials Science and Engineering there. The results were published in today’s online edition of Advanced Materials. In recent years engineers have invented many miniaturized devices, including medical implants, flying insect-like robots, and tiny cameras and microphones that fit on a pair of glasses. But often the batteries that power them are as large or larger than the devices themselves — which defeats the purpose of building small. To get around this problem, manufacturers have traditionally deposited thin films of solid materials to build the electrodes. However, due to their ultrathin design, these solid-state micro-batteries do not pack sufficient energy to power tomorrow’s miniaturized devices. The scientists realized they could pack more energy if they could create stacks of tightly interlaced, ultrathin electrodes that were built out of plane. For this they turned to 3D printing. 3D printers follow instructions from three-dimensional computer drawings, depositing successive layers of material — inks — to build a physical object from the ground up, much like stacking a deck of cards one at a time. The technique is used in a range of fields, from producing crowns in dental labs to rapid prototyping of aerospace, automotive, and consumer goods. Lewis’ group has greatly expanded the capabilities of 3D printing. They have designed a broad range of functional inks — inks with useful chemical and electrical properties. And they have used those inks with their custom-built 3D printers to create precise structures with the electronic, optical, mechanical, or biologically relevant properties they want. To print 3D electrodes, Lewis’ group first created and tested several specialized inks. Unlike the ink in an office inkjet printer, which comes out as droplets of liquid that wet the page, the inks developed for extrusion-based 3D printing must fulfill two difficult requirements. They must exit fine nozzles like toothpaste from a tube, and they must immediately harden into their final form. In this case, the inks also had to function as electrochemically active materials to create working anodes and cathodes, and they had to harden into layers that are as narrow as those produced by thin-film manufacturing methods. To accomplish these goals, the researchers created an ink for the anode with nanoparticles of one lithium metal oxide compound, and an ink for the cathode from nanoparticles of another. The printer deposited the inks onto the teeth of two gold combs, creating a tightly interlaced stack of anodes and cathodes. Then the researchers packaged the electrodes into a tiny container and filled it with an electrolyte solution to complete the battery. Next, they measured how much energy could be packed into the tiny batteries, how much power they could deliver, and how long they held a charge. “The electrochemical performance is comparable to commercial batteries in terms of charge and discharge rate, cycle life and energy densities. We’re just able to achieve this on a much smaller scale,” Dillon said. “Jennifer’s innovative microbattery ink designs dramatically expand the practical uses of 3D printing, and simultaneously open up entirely new possibilities for miniaturization of all types of devices, both medical and non-medical. It’s tremendously exciting,” said Wyss Founding Director Donald Ingber, M.D., Ph.D. The work was supported by the National Science Foundation and the DOE Energy Frontier Research Center on Light-Material Interactions in Energy Conversion. In addition to Lewis and Dillon, the paper’s authors included: Ke Sun, a graduate student in Materials Science and Engineering at the University of Illinois at Urbana-Champaign, who’s the lead author; Teng-Sing Wei, a graduate student at Harvard SEAS; Bok Yeop Ahn, Ph.D., a Senior Research Scientist at the Wyss Institute and SEAS; and Jung Yoon Seo, Ph.D., a visiting scientist in the Lewis group, from the Korea Advanced Institute of Science and Technology. The Wyss Institute for Biologically Inspired Engineering at Harvard University http://wyss.harvard.edu) uses Nature’s design principles to develop bioinspired materials and devices that will transform medicine and create a more sustainable world. Working as an alliance among Harvard’s Schools of Medicine, Engineering, and Arts & Sciences, and in partnership with Beth Israel Deaconess Medical Center, Brigham and Women’s Hospital, Boston Children’s Hospital, Dana Farber Cancer Institute, Massachusetts General Hospital, the University of Massachusetts Medical School, Spaulding Rehabilitation Hospital, Boston University, Tufts University, and Charité – Universit_tsmedizin Berlin, the Institute crosses disciplinary and institutional barriers to engage in high-risk research that leads to transformative technological breakthroughs. By emulating Nature’s principles for self-organizing and self-regulating, Wyss researchers are developing innovative new engineering solutions for healthcare, energy, architecture, robotics, and manufacturing. These technologies are translated into commercial products and therapies through collaborations with clinical investigators, corporate alliances, and new start-ups.